By now, we all know that the popularity of mobile is helping to drive website traffic and conversions. However, these engagement rates are greatly impacted by the time of day and season, according to a new study. 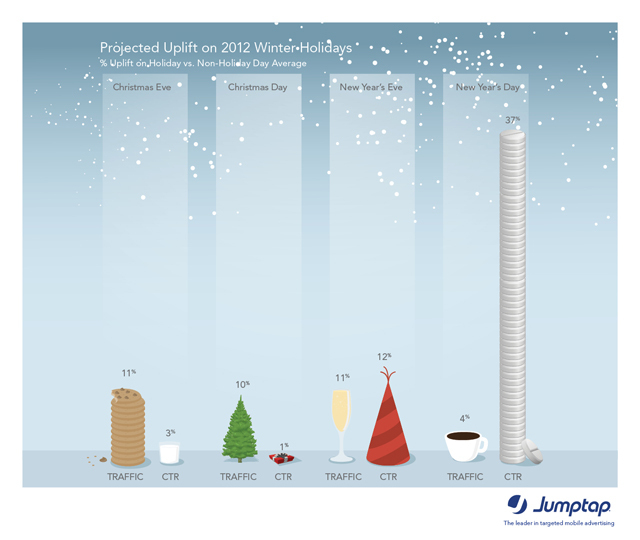 In fact, the Jumptap MobileSTAT study reveals that mobile click-through rates (CTR) build throughout the holiday season and peak on New Year’s Day, which receives 37 percent more than the average CTR. Conversely, the highest conversion rates (CR) actually appear in the summer time and peak in July. Additionally, the study found that although smartphone usage rates remain steady throughout the day and increases gradually at night, tablet usage is clearly the heaviest in the evening, peaking at 87 percent more than the average rates during and after primetime TV viewing. These statistics mean that whether the goal is a better CTR or CR, marketers should take the season into account when planning their mobile advertising campaigns. Furthermore, marketers should incorporate day-parting and tablet targeting into their campaigns in order to reach consumers as they jump from devices throughout the day. “Holidays usher in an influx of consumer excitement around new mobile devices, as well as more time spent indoors. By understanding and leveraging mobile consumer behavior during this time period, advertisers gain a leg up to maximize mobile campaign metrics,” said Matt Duffy, VP of Marketing at Jumptap. “With mobile ad spend peaking in Q4, now is the time to ensure you’re implementing these optimization strategies."